I’m not much of a beef eater so I hardly order steaks. If I do order anything made from beef, it would probably either a salt beef sandwich or pastrami (the more kosher, the better!). 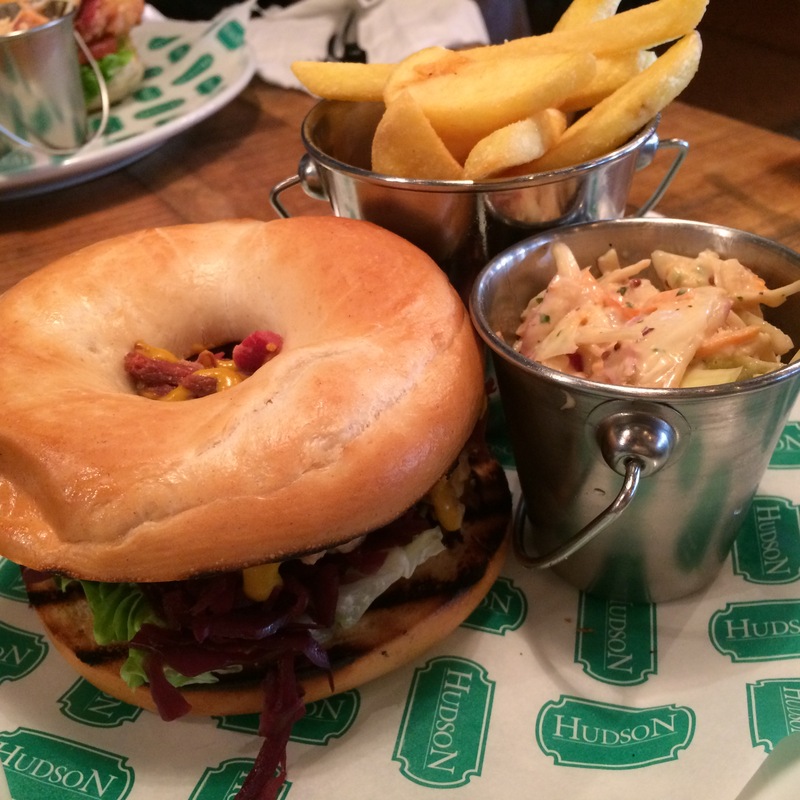 So imagine my delight when I found out you could get a salt beef bagel from an American-inspired bar in Colchester! I read through the menu and wondered what the food would be like. It looked promising with club sandwiches, salt beef bagels and hotdogs on offer. With a claim that they served fabulous Atlantic cuisine and that they were inspired by downtown Manhattan, I was looking forward to tucking into my salt beef bagel. Well, I’ve had my salt beef bagel and I was a tiny bit underwhelmed. The salt beef was a tad on the dry side but I guess I’ve been spoiled by the Bell & Brisket and Monty’s Deli because they made REALLY good salt beef from scratch and each sandwich would be prepared as ordered from a batch that was probably made the same day. The space was amazing and it was big and airy. But the concept confused me a little bit because it felt like I was walking into a southern restaurant instead of a Manhattan bar. Will I be going back to Hudson? I’m not sure. Maybe their other offerings are okay, they may even be really good. But it’s quite hard to get a salt beef sandwich wrong — if you have great salt beef to begin with. Don’t get me wrong, the food looked okay and the coleslaw and fries that came with it were really nice. I’m just really picky about my salt beef. And unfortunately for them, I wasn’t too impressed.